In its current reincarnation, Posterer is relatively new, although every attempt has been made by the Zimmerman family to create an ‘olde worlde’ atmosphere but it’s not over the top. It’s quite a small stube and, on the two times we went, was pretty full, so we didn’t stay too long. Of all the Zoigls that we tried, that in Zum Posterer seemed to be the gassiest and, thus, was not our favourite. Perhaps we would have made more visits but its opening coincided with Zum Roud’n and there was only one winner in that competition. I met Herr Gunter Zimmermann at the kommunbrauerei and he turned out to be a most friendly and welcoming person (more on this meeting later). Regarding Zum Posterer, he explained that it was hard to survive just on stube, so the family has launched an entertainment complex in part of the old porcelain factory (this is known as ‘Zoigl-Fabrik’). Gloser was our final stube in Windischeschenbach and is quite an impressive place. 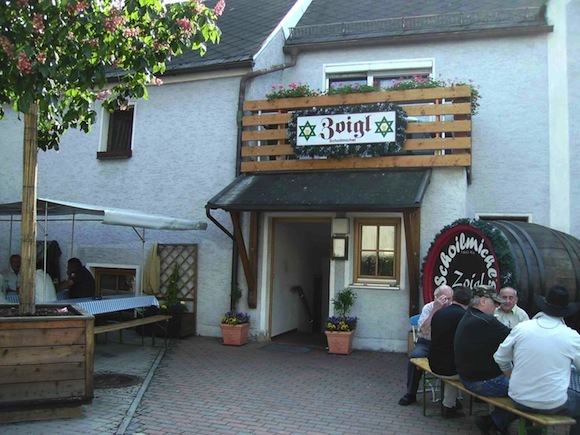 Like Roud’n, you enter through a courtyard (very reminiscent of the schwemm in Bamberg) before reaching a charming enclosed beer garden. 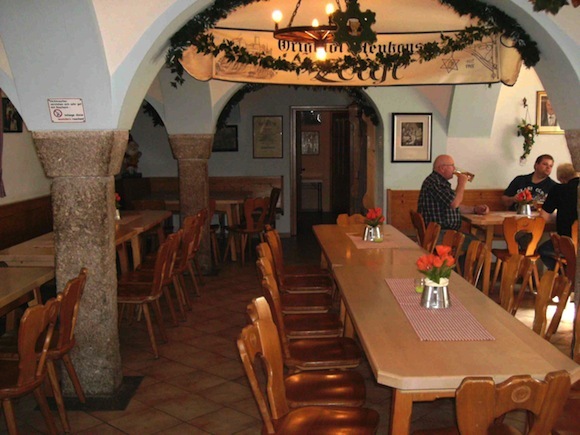 The interior is not unlike Roud’n but slightly larger and more like a conventional Bavarian pub (long tables, etc.) than someone’s domestic quarters. However, it is quite atmospheric and the service was always very friendly and efficient. The Zoigl was excellent, although a little more gassy than Binner, Loistl or Roud’n. I really like Schoilmichl, so we were quite pleased to have another opportunity to visit. 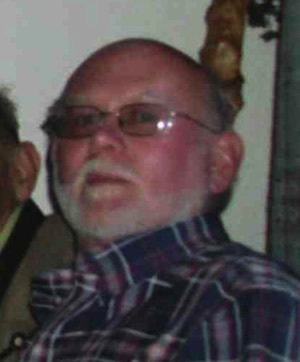 As last year, owner Manfred Punzmann did his damnedest to converse but he can never understand us and we can never understand him – still he makes the effort. 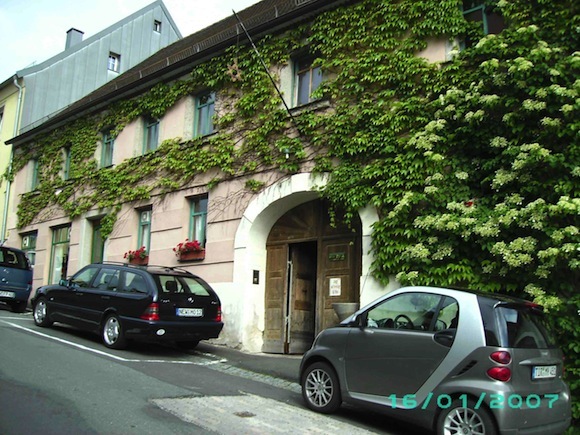 H. Punzmann is quite involved with the kommunbrauerei, which is next door to his Zoiglstube. Schoilmichl Zoigl is characteristically Neuhaus – much lighter colour and taste, only very lightly carbonated and quite hard to tear yourself away from! There is a nice keller area at the front of the pub, with ample shading for sunny days and the downstairs bar is quite spacious and airy. All in all, a most pleasant place to while away a few hours. We were lucky to find Bahler open during our visit, as it wasn’t one of their scheduled weekends. However, in typical Oberpfalz ‘let’s find some obscure reason to have a festival’ fashion, they were open for one day for a fish festival. This seemed a little bizarre, but fish seem to be a pre-occupation of both towns (they form the Eschawo coat of arms). I am not that knowledgeable on local customs but think that the Waldnaab and other local rivers are noted for their stocks of fish. However, as we’re vegetarian, I’m afraid I can’t give a first-hand opinion whether the fish being barbecued at Bahler’s was any good. But, the locals were tucking in it with gusto, as they were into delicious looking gateau, ice cream, cheese platters and, of course, Zoigl. So, we opted for the latter two and they were excellent! We only made a brief afternoon visit to Lingl. It has a pleasant garden and we enjoyed excellent Zoigl and a very tasty Obatzter (cheese mixed with onions and herbs). I had a swift look inside and it seemed to be quite a spacious establishment – in fact, more like a conventional pub/bar. I’m not sure but I think that Lingl-Zoigl actually doubles as a pub outside its Zoigl opening time (Zum Heimgarten). 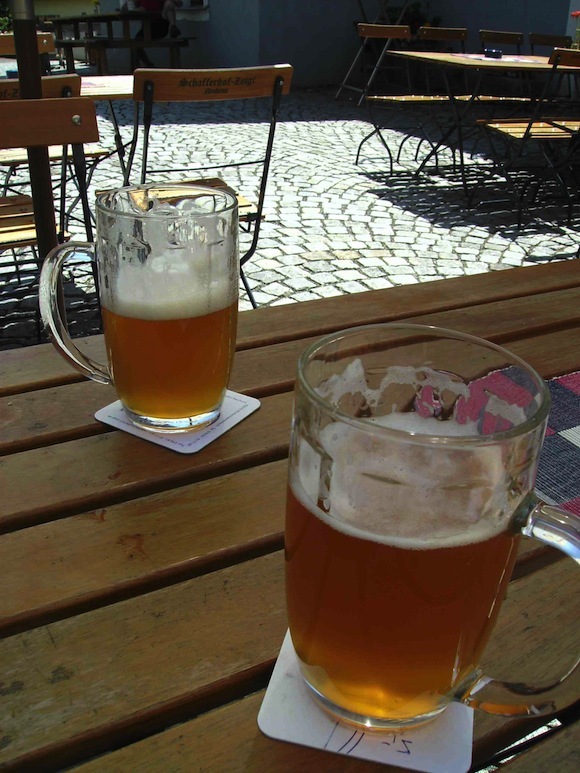 One little anecdote – and a warning to those not familiar to German bar customs. Our bill came to around €12 and I gave the waitress a €20 note, politely saying ‘Thank you’. She looked at me very quizzically and then questioned whether I intended to give her a €8 tip! Then I remembered that something similar had happened to me in Mahr’s in Bamberg. There, however, the waitress simply pocketed the change in her wallet, thanked me with a smile and walked away. The morale of the story is to keep quite when you hand over your dosh and only say thank you when you have received your change, at which point, you can decide on the size of the tip. This is a truly beautiful place, situated next to the burg. It has a smallish, atmospheric inside bar and lots of seating outside. On our first visit, we were lucky enough to meet Ludwig, who was delivering cigarettes! He immediately got the keys and proceeded to give us a guided tour of the grounds and buildings. Of greatest interest is the beer cellar, which is cut into the hillside. 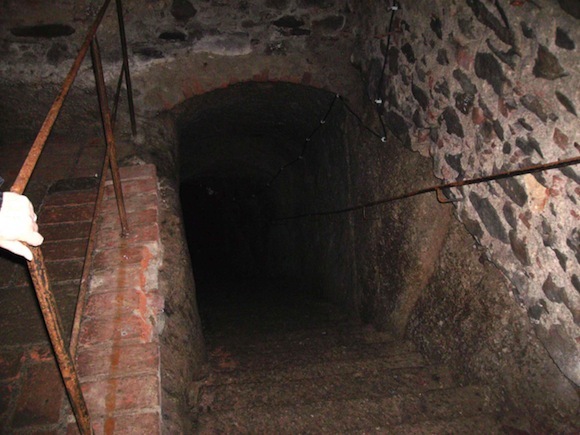 Many years ago, the beer was stored in the cellar through the summer months ensuring a constant supply of Zoigl. I have a permanent souvenir of the cellar as I managed to bang my head on the low roof! Our second visit coincided with a music festival and we were fortunate, on a beautiful sunny day, to be serenaded by a local brass band, whilst we supped delicious Zoigl and ate Obatzer. Life doesn’t get much better than that! Through Anton Heinl, I was able to find the date for the next brewing session and turned up at the brewery hoping to have a look round. 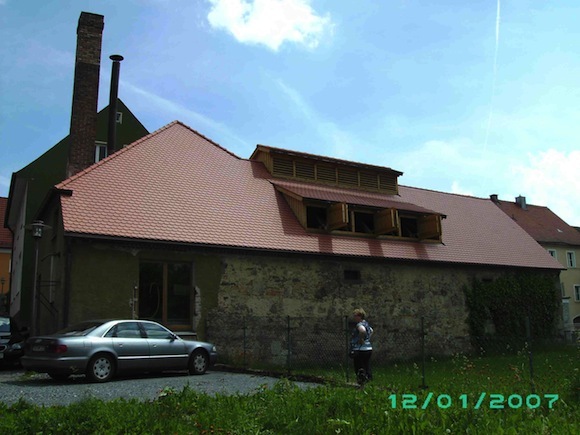 A word about the brewery: I’m not sure exactly when it was built but the outside is looking a bit worse for wear, although it does a very smart new roof. 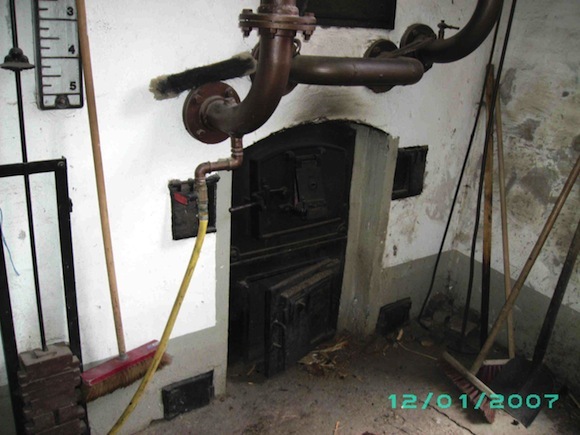 Inside, it’s pretty cramped and the first thing you see when you enter is the door to the wood-fired furnace. Just past the furnace is a flight of metal stairs leafing to the main brewing area. My host was Gunter Zimmermann from Zum Posterer and, with the help of the braumeister (who didn’t speak English), they were able to take me though the brewing process. Incidentally, not all the Zoigl brewers enlist the help of a professional braumeister but Gunter explained that he was relatively inexperienced and was still learning. 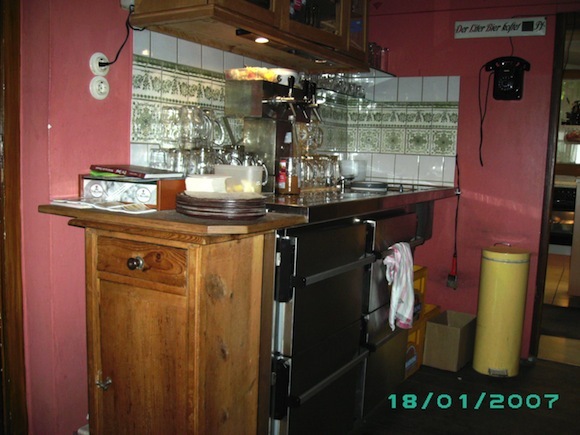 I understand that the Zoigl brewers are not legally obliged to use a qualified braumeister, if they only sell their beer at their own stube. However, Gunter supplies other outlets and this does require him to have a qualified braumeister. There’s not much point in going through the brewing process, which seems much the same as any other brewery, only smaller! Gunter uses a 50/50 mixture of München and Pilzen malt, which is bought in from a local supplier. He had experimented with other mixtures but had finally settled on this as the one most favoured by his customers. I understand that most of the other Zoigl brewers use this 50/50 mixture but there might be a few minor variations. The individual Zoigl brewers purchase their own supplies and this contributes to the variations in taste between the different outlets. I can’t recall the type of hops used by Gunter but am pretty sure that they came from the Czech Republic. I didn’t have the chance to see the Neuhaus brew house in operation but understand that all the Zoigl stube there use 100% Pilzen malt and this certainly would account for the lighter colour and taste. I had the chance to taste the warm wort and it tasted like… well, exactly as you might expect: a warm sweet malty drink, quite pleasant but you wouldn’t want too much of it – unlike its fermented brother! 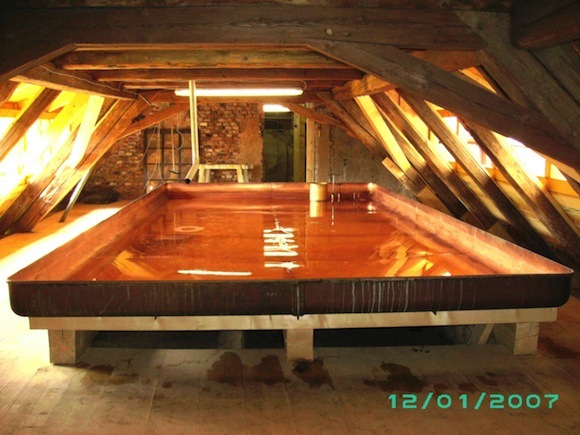 The top floor is totally occupied by the cooling tank, which is open and made from copper, about forty centimetres deep, eight metres long and five metres wide. Gunter reckoned that it was over a hundred years old. The average brew is around 2,500 litres. Normally, the brewing process starts around six in the morning but this presents a few problems in the summer months, as it is quite warm at night. 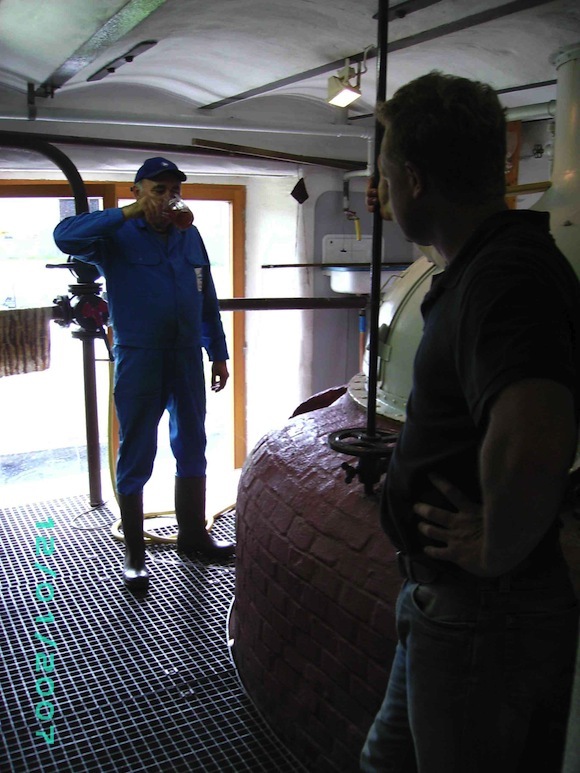 Gunter explained that, in the summer, he starts a bit later – around ten a.m. and this ensures that the wort arrives in the cooling tank at the optimum time. The following morning, the cooled wort is pumped into the communally owned tanker and transported to the stube, where hopping takes place and yeast is added. I would have thought that the individual stube would have quite carefully preserved and re-used their individual strains of yeast but Gunter told me that they tend to buy yeast that has been used once from a commercial brewer. We found Windischeschenbach/Neuhaus an absolutely delightful place to spend a holiday. To be honest, before we went, I thought that three weeks would be too long but, the way that the airfares worked out, it was simply a choice of either spending more money on travel and staying a shorter time, or less on fares and allocating the difference to accommodation. In addition, Germany, particularly the rural areas, is much, much cheaper than Ireland for food and drink, etc., so it was a ‘no-brainer’ to opt for a longer period. Kind people on the forum suggested beer-related excursions but, apart from a trip to Weiden (OK but nothing really special), we didn’t stray outside Eschawo. The surrounding area is really beautiful and we would have liked to have walked more. Sadly, my spouse is a little restricted by a hip injury at present but we had several walks in the scenic Waldnaabtal – on one occasion, guided by one of our new-found from Loistl (thank you, Brigitte). We would have liked to have made it to Falkenberg to visit the Kramer-Wolff Zoiglstub’n but a twenty-four kilometre walk was too much and there is no way you can get there sensibly from Windischeschenbach by public transport. So, we had to leave that for the next visit. We were lucky with the weather – only three bad days out twenty-one. The temperature for the rest of the time ranged from twenty to thirty-five degrees Celsius – just right for a nice walk and then a refreshing Zoigl! About a mile outside the town, there is a fabulous open-air swimming pool (freibad) and, at the amazing entrance fee of €3, it got quite a few visits. The local museum in the Neuhaus burg is also worth a visit – I didn’t realise that Windischeschenbach was a big resettlement area for German people from the Sudetenland and there was lot on their traditions and customs. Our ferienwohnung was excellent and our hosts were extremely helpful and hospitable – they even had a barrel of Teicher Zoigl from Neuhaus in their cellar, which we were free to sample - it was excellent! In our host’s opinion, it is the best Zoigl in Wind/Neuhaus. I’m not sure that I totally agree but I couldn’t put a very strong argument against their view. The only minor downside on the accommodation was that it was a little out of the centre (about a ten-minute walk) but, at €30 per night for a two-bed apartment, I’m being really picky. So that was our visit to Eschawo – my spouse decided that it was the best holiday that we’ve ever had – and who am I to argue! Which number is highest 36 or 30?